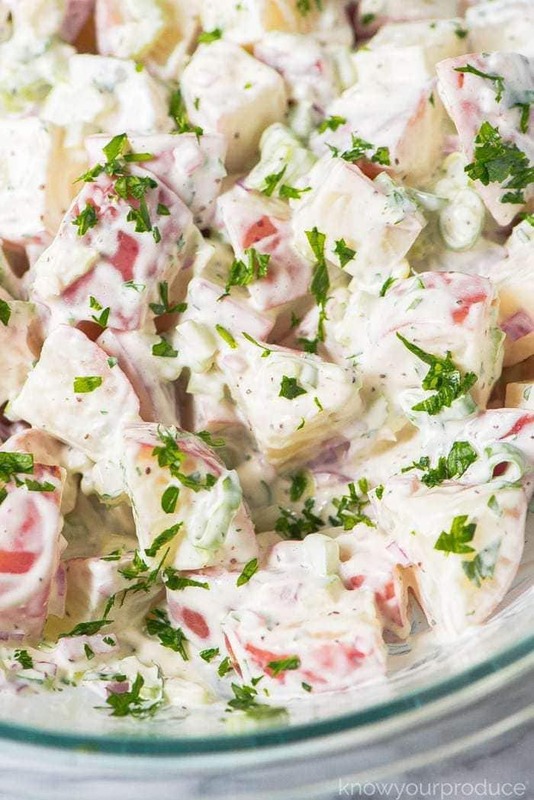 Vegan Potato Salad is one of the comforting recipes that everyone should know how to make. 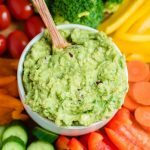 This recipe uses vegan mayo! Salads are a potluck staple. 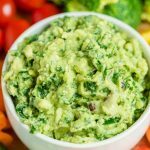 You can bring this to a backyard bbq, birthday parties, holiday dinners, or even a simple get together. 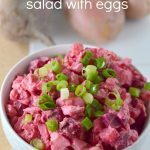 It’s so easy to make a simple creamy potato salad that’s vegan! Start off by making the potatoes first as they take the longest time to cook. 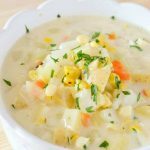 You’ll want to chop them up into bite size pieces and then place into a larger pot with water covering the potatoes, at least 2 inches over them. Allow them to boil and cook until fork tender. Drain once they’re fully cooked to your liking. While the potatoes are cooking you can prep the vegetables, herbs, and dressing. Once the potatoes are finished toss them in a large bowl with the veggies and dressing. 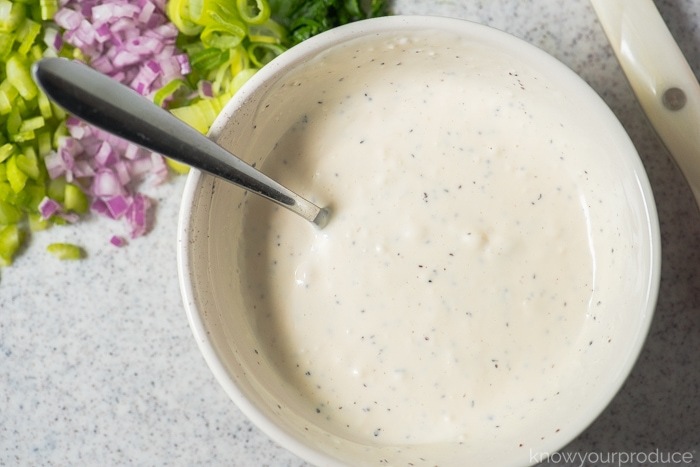 To make the dressing you’ll need vegan mayo, vinegar, salt, pepper, and celery seed. Simply mix it all up and then pour over the potatoes. 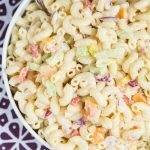 You could even use this dressing recipe for a pasta salad too, just add in a few more herbs and even some citrus if you’d like. 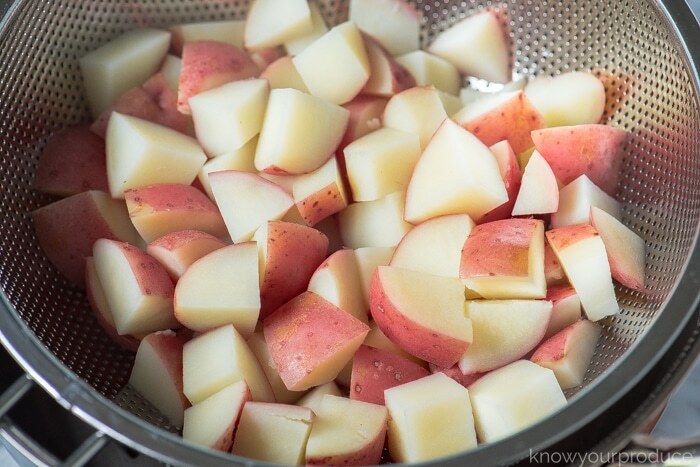 cut the potatoes into uniform bite size pieces – when you cut them all the same size they will cook at the same time. leave the skins on – potato skins are loaded with vitamins and minerals like vitamin C, vitamin B, iron, potassium, calcium, and even fiber. don’t overcook the potatoes – you want a nice bite to the potatoes, not super hard, but not too soft that they’re falling apart, that would be better for mashed potatoes (unless you want them softer, that’s fine too!). swap onion for more green onions if you don’t want raw onion, or even leave it out altogether. 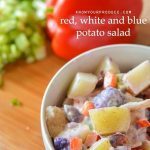 let this salad sit in the refrigerator for at least 2 hours – potato salad is best served cold and you allow the flavors of all the veggies and herbs to get into the potatoes and dressing. want more color? add fresh herbs after mixing – you can even add paprika for more color. want more of a mashed potato salad? use a starchy potato like russet or Idaho instead of a waxy potato like new potatoes/reds. You can find many options in the markets these days and it’s great to have options! 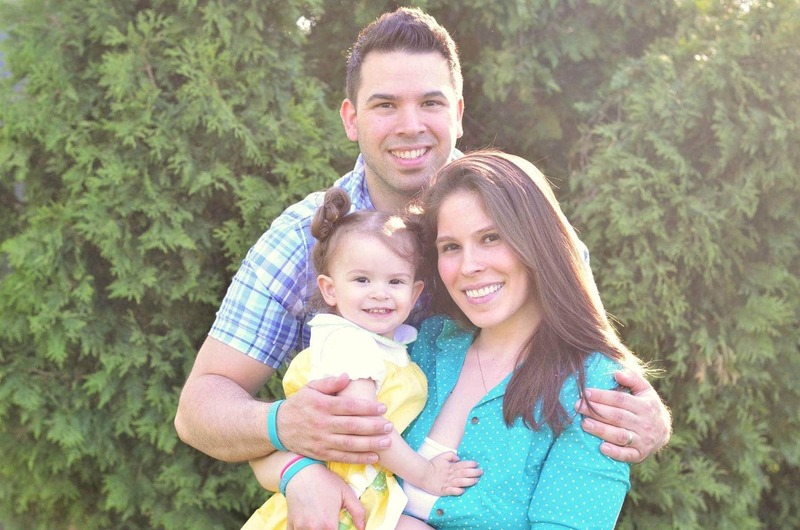 Our two favorites are JUST and Hellmann’s. 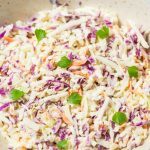 if you like this vegan side dish you’ll also love our vegan coleslaw! 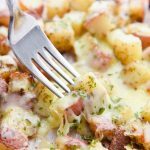 Chop up the potatoes into bite size pieces. Fill a large saucepan with water and add in the potatoes. Cook the potatoes until fork tender, or desired texture. While the potatoes are cooking, prep the veggies and dressing. 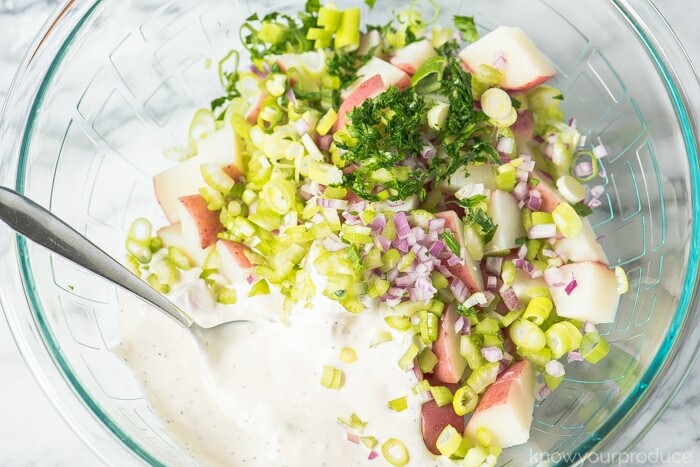 To make the potato salad dressing you'll mix together the vegan mayo, vinegar, salt, pepper, and celery seed. Once the potatoes are done add them to a large bowl with the veggies, herbs, and dressing. 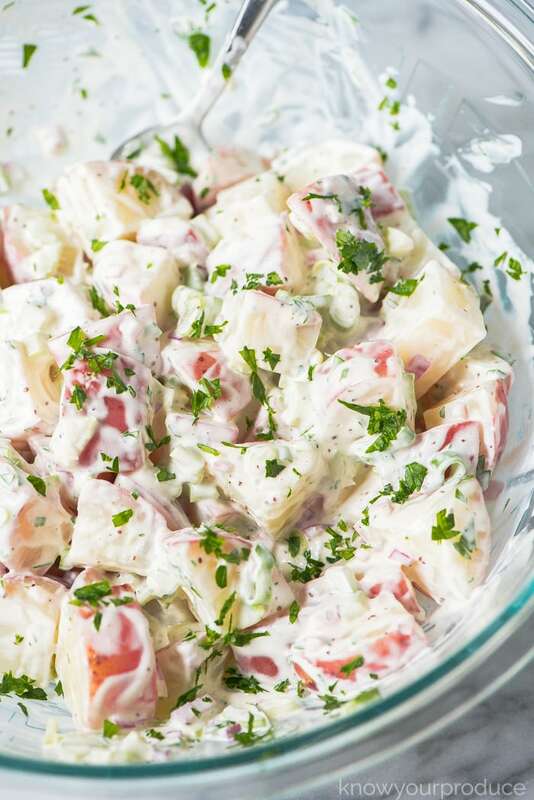 Mix the potato salad and then refrigerate until ready to serve. 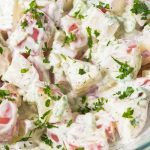 Potato Salad is one of those dishes that are always better the next day. If you're planning to go to a party tomorrow, make the potato salad the night before. It will be extra flavorful!